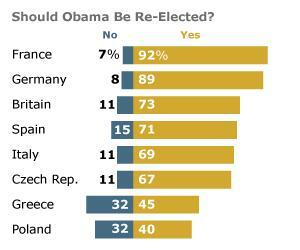 From a European perspective, the US election should be no contest, as these results from an opinion survey by Pew indicate. 1) Many Republican Party supporters campaign to have intelligent design taught on an equal footing to Darwinian evolution in schools. 2) Climate change denial appears to govern Party policy on what may well be the greatest threat mankind currently faces. 3) Party leaders appear to at best tolerate, if not promulgate, the idea that tax cuts (particularly for the rich) will increase tax revenue, despite all the evidence to the contrary. 4) Veracity seems to be in short supply in Party speeches and propaganda in the current election. In other words significant sections of the Republican Party seem to have a problem with reality, or as Paul Krugman says, facts have a liberal bias. Of course the two major parties in the UK have their more extreme elements, but these are either much less extreme, or much more marginal, than in the Republican Party. Indeed, it is generally thought that when this ceased to be the case for the Labour Party in the 1980s, it did Labour great harm in terms of the popular vote. Labour leaders learnt that attacking these extreme elements within their own Party won them votes. There appears to be another puzzle, and that is that many Republican voters seem to be voting against their own economic interest. Residents of red states tend to receive more government transfers than blue states. More generally, how can the poor possibly vote for a party which is so devoted to tax cuts for the (very) rich and reducing aid to the poor? Now one possible answer to this puzzle is that facts, veracity and economic benefits are not at the top of many voters list of what they look for in politicians. It’s all about values. ‘Culture Wars’, traditionalists versus progressives, that kind of thing. Perhaps voters in Kansas just value individualism and religious belief more than European voters, and creationism, climate change denial and tax cuts convey these values. I’m well outside my comfort zone here, but I want to suggest an alternative answer. In the decades around the 1970s, there was much discussion in the UK about the apparent enigma of the Conservative working class voter. Previously it was argued that voting, and the two political parties in the UK, had been split along class lines – the Labour Party could be said to represent the working class. How then to explain that a growing number of the working class were apparently voting against their own party? In a paper written in 1967, the sociologist Frank Parkin turned that question on its head. The dominant culture, he suggested, was conservative with a small ‘c’. The relevant enigma was therefore not the working class Conservative, but the Labour voter of any class. The latter could be understood by considering the strength of working class networks (e.g. trade unions) that could resist the influence of the dominant conservative culture, and the changing strength of institutions promulgating that dominant culture. Of particular importance was the growing influence of radio and television as conveyors of information and values. In the UK the state played a central role in the development of radio and television, through the BBC. It appears as if most European countries followed a similar model. Now this can have severe disadvantages if the state decides to take too much control, but in many European countries there are various safeguards designed to minimise the influence of the particular party in power over what is broadcast. I want to suggest that this set up has some important implications. State controlled media will tend to be centrist in its outlook, and dismissive of extremes. It will also try and reflect establishment views and opinions, which include academic scientific opinion and mainstream religious views. Partly as a result, a political party which appeared to tolerate the views listed above would be given a hard time. I’m also pretty sure that party leaders would not be able to get away with being as ‘economical with the truth’ as Ryan’s convention speech was. In the US public sector broadcasting is not a major force. Now there is a chicken and egg problem here: perhaps the US media model may reflect different values, like a greater aversion to state power. However it could also just be a consequence of the political power of corporations in the US at a particular point in time. As Robert McChesney documents, it was not inevitable that the private sector model that now dominates in the US should have emerged, although once it was established it became easier to sustain this position. My key point is that this lack of a major state presence in TV and radio makes it easier for those with money to try and control the information and social values promulgated by media. In the UK we are used to newspaper barons manipulating news and opinion to further their own or a political party’s views on particular issues. However the BBC, together with a legal requirement on other TV channels to be politically balanced, limits the scope of newspapers to manipulate information or change values. Surveys repeatedly show much higher levels of trust in the BBC compared to the media in general. Undoubtedly the press does have considerable influence in the UK, but few would argue that it alone could fundamentally change the political landscape. However, if both TV and radio were able to work to the same model as newspapers, such manipulation becomes a distinct possibility. Just as Frank Parkin argued that the working class Conservative voter was not an enigma in the UK once we thought about the dissemination of information and values, so the steady drift to the right of the Republican Party could be explained in similar terms. Paul Krugman argues that pundits who describe America as a fundamentally conservative country are wrong. What I am suggesting is that the drift to the right of the Republican Party may be a function of the ownership structure of the media in the US. If true, this raises two questions. First, has this process in the US been there since the invention of radio and TV, or is it more recent, and if so why? (Simon Johnson amongst others suggest it started with Reagan.) [Postscript 2: Mark Sadowski provides the answer which I should have known about below: the repeal of Fairness Doctrine.] Second, does the two party system in the US provide a limit to the power that money can have over the media, or does the trend have further to go? Much the same holds true as far as newspapers go. In Boston, where I live, the Globe is left of center, the Herald right, though the Globe has a couple of right-wing columnists. I suspect few Americans read the NYTimes, which is clearly liberal, though it has at least one nitwit right-wing columnist who claims to be non-partisan. Many, if not most, cities have only one newspaper, which might go either way. Add to that occupational matters. The educated class. which is relatively small, tends toward the left, the others toward the right. People who make their money on Wall St. or work for big banks, almost all vote for the right, which favors "small government," that is, no regulation of businesses like banks. Organizations like the National Chamber of Commerce, run by big business, also favor the right. There are4 alwo cultural biases--the right-wing Tea Party gets a great deal of support from Evangelical Christians, who tend to doubt Global Warming, evolution, and other truths supported by scientists. They also distrust government. Location matters, too--the Appalachian areas and the South have always distrusted government. Colin Woodard's "American Nations" explains a lot of the direction of politics in various areas. Among newspapers distributed Monday through Friday, The Wall Street Journal ranked first, reporting an average daily circulation of 2,117,796. Rounding out the top five were USA Today, with 1,829,099; The New York Times, with 916,911; The Los Angeles Times, with 605,243; and The San Jose Mercury News, with 577,665. Six months ago, the fifth-ranked newspaper by circulation was The Washington Post. But the new calculations consider so-called branded editions, which are local and regional papers that have their own titles but are branded under a larger paper’s name. So The Mercury News moved up on the list and The Washington Post dropped to No. 6, with an average daily circulation of 550,821. The New York Times topped the list of Sunday newspapers, with a total average circulation of 1,339,462. The Times was followed by The Los Angeles Times, 948,889; The Washington Post, 852,861; The Chicago Tribune, 780,601; and The San Jose Mercury News, 636,999. The Wall Street Journal does not publish a Sunday edition. So, the NYT is third in circulation, hardly "few Americans". As Andrew Gelman always points out the poor are Democratic, even in the hinterlands, it is just the rich and the wannabes are much more Republican, particularly there, and dominate the agenda, funding, and voting. Britain is much more urban like New England and the coasts, and urban areas are Democratic while much of America is rural Republican with suburbs in between being the battleground. Republicans were discredited by the Great Depression, and only slowly worked their way back, generally through the military. Reagan rehabilitated them on the domestic side. Faux News which Rupert Murdock developed in 1986 is at the center of this, popular enough to provide steady entertainment for Jon Stewart and Stephen Colbert. Troubled times breed the desire for security, so I don't think it over yet and a loss may only yield a stalemate, but there is a paucity of talent that may only lead to more defeats as their supporters die off. I agree that the media structures play a significant and antagonistic role, but I do not think that it is the root cause. I've lived amongst the white working class here in the Midwest all of my life and I believe the root cause of all the trouble is the inversion of politics that occurred in the 60s-70s due to libertarianism (right and left). The country was dominated (1932 onwards) by generally a social conservative-economic liberal (unions-income redistribution, etc.) way of political thinking up until that time (mid-70s). The social libertarians have come to dominate the Democratic Party and the economic libertarians have come to dominate the Republican Party-libertarianism in general has served as a polarizing agent. The government and the citizenry is hopelessly paralyzed as a result. Globalization has wreaked havoc on the lives of the working class, while mostly sparing the educated elites. The educated elites are where you find the left and right libertarians, so the working class is now being manipulated by crass populism. "What I am suggesting is that the drift to the right of the Republican Party may be a function of the ownership structure of the media in the US. If true, this raises two questions. First, has this process in the US been there since the invention of radio and TV, or is it more recent, and if so why?" The Fairness Doctrine was a policy of the United States Federal Communications Commission (FCC), introduced in 1949, that required the holders of broadcast licenses to both present controversial issues of public importance and to do so in a manner that was, in the Commission's view, honest, equitable and balanced. The FCC decided to eliminate the Doctrine in 1987. The end of the Fairness Doctine led to the rise of right-wing talk radio, Fox News and effectively led to the end of investigative news jounalism and high quality news coverage in the United States. Now a huge segment of the American population tunes in daily for their dose of infotainment and mass brainwashing courtesy of a media totally scripted by giant corporate interests. Mark - thanks for this, and giving me an excuse for my ignorance. But in a way I'm quite pleased, because without this information I was concerned that my hypothesis could not explain why the rightward drift started under Reagan. It is also interesting that Congress tried to reinstate the doctrine, but that this was vetoed by Reagan. does pew have any sort of baseline? what did the results look like in 2004, or 1996? maybe europeans just aren't big on change??? I want my welfare check, please productive people work so I don't have to. Classic European. I suspect that part of the difference is that in European parliamentary democracies, winning elections implies a mandate to govern. In the US, it's nearly impossible to win a mandate to govern--which requires a majority in the House, an impossible "supper-majority" in the senate, the white house, and at least a sympathetic supreme court. In addition, states are semi-autonomous, and often defy congress, so you also need to have a coalition at the state level willing to participate in federal initiatives. The result is that politicians here can make ludicrous claims because they know their ideas will never truly be enacted (at best, a watered-down compromise version will pass, giving ample room to blame the other party when it fails). The US also suffers a bit from the fact that a significant block of our politicians are "professional bipartisans" who will only support their party on issues that are also supported by members of the other party, which gives the other party considerable leverage. In the senate, there are 8 such democrats, meaning that unless the democrats could muster one or more republican votes, they never had more than a 52 votes in the Senate, even though there were 60 members of the democratic caucus. This explains something I had been puzzling over - the Republican preoccupation with killing PBS/NPR. I thought it might be about advertisers' donor money seeking access to the Public Media demographic, but had a suspicion it was more about destroying credible alternatives to corporate truthiness. This article confirms that the latter is most likely to be the case. Fascinating article -- many thanks. What type of model should central banks use?